What happens to people who go through extreme trauma? What happens to their future generations as they grapple with parents and grandparents with indelible stains on their psyche? The survivors of war and genocide, whether Syria, Bosnia, or Bangladesh can all attest to painful answers to these questions. Kaminsky answers them through the stories of Israeli Jews. Much has been written about the Jewish survivors of the Holocaust, but most of it is in the form of historical fiction, or even nonfiction that deals with death as a clinical thing. Little is written from the current backdrop of Jews in Israel who struggle with a collective history full of trauma. In the recent political tussle, often deadly, between the Israelis and the Palestinians, the stories of their Jewish predecessors who fled Nazi Germany gets lost, at least from an international literary perspective. The plight of Palestinians, who are undergoing their own trauma now, notwithstanding, those stories of earlier Jews deserve to be told as well. Kaminsky’s attempt in The Waiting Room is testament to that need. The story revolves around Dina, the daughter of holocaust survivors, and her dead mother who is her constant companion as a ghost/confidant. If some readers balk at this strangeness, it is only during the initial pages, because the story pulls you in regardless. Dina is not the ordinary Israeli Jew in that she hates living in the Holy Land. She is Australian, only moving to Israel because of her husband’s intense love for that nation. She herself is a doctor, and much of the book takes place in and around her waiting room. Galutnik: a Diaspora Jew. To many Israelis, the word also means coward, an eternal victim as opposed to the strong sabra Jew born in Israel. 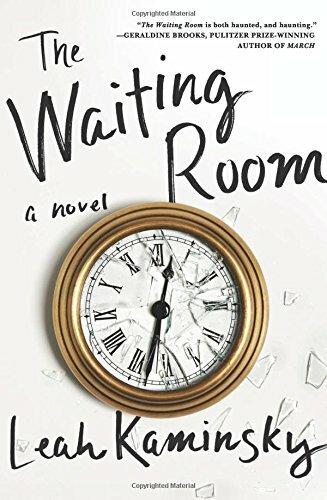 But in the end, The Waiting Room is about Jewish lives, past, present and future. Dina is haunted—literally—by her mother’s ghost, who survived the Holocaust but lived the trauma of it for the rest of her life. Slowly, the story of the mother’s escape unfurls, including her own guilt at having abandoned her mother—Dina’s grandmother—at the train station to work for SS soldiers. Those who live have a burden to carry that those who die don’t, and that is the theme that runs most strongly across the entire novel. Dina imagines a soft sighing seeping up from the earth, melting into the windless air. The murmuring of the dead. Their voices becoming a steady whisper that followed her mother everywhere. Unsurprisingly for someone who lives in the past to such an extent, Dina’s complete fears of the future are an important part of the novel as well. How she worries for her son, who will have to enter Israel’s army when he becomes a certain age. How she wonders if every person on the street is a possible terrorist. Is this what trauma—even transferred trauma from parents—does to you? She gravitates toward others who have led miserable lives, such as her patient Tahirih, a Baha’i woman whose husband was killed in Iran. She is repelled by a Jewish neighbor who kills kittens and accuses Arabs of being “a bunch of murderers.” Readers get snippets of all these rich lives, and a tapestry of characters is born. Yet stories like these are important. They help us heal, and they help us understand why people do inexplicable things. Equally important are stories of the other side, like those of the Palestinians. Including those stories in The Waiting Room would have made this novel all the more stronger and multidimensional. Here’s to hoping that Kaminsky will continue to tell untold stories from all sides in the future.